The Large Area Telescope (LAT) on the Fermi Gamma-ray Space Telescopes sees more than just gamma rays. In fact, for every gamma ray observed, the LAT also detects around 1500 cosmic rays. At a rate of around 500 per second, cosmic rays are the largest background for the LAT. The first line of defense in distinguishing between cosmic rays and gamma-rays is the LAT's Anti-Coincidence Detector (ACD). Cosmic rays (green) and gamma rays (magenta) hitting the ACD over 1 second of elapsed time. Each time a cosmic ray hits an ACD tile, a little bit of light is deposited through ionization and scintillation. The ACD consists of 89 plastic scintillating tiles and 8 plastic scintillating ribbons, and each ACD element is connected to two photomultiplier tubes (PMT) for a total of 194 PMTs. The ACD covers 5 sides of the LAT. Wavelength shifting optical fibers are embedded in each ACD tile to guide scintillation light produced from cosmic-rays into the PMTs. A single ACD tile with wavelength shifting optical fibers (left), and the assembled ACD prior to integration and launch (right). When a cosmic ray passes through an ACD tile, a little bit of the cosmic ray's energy is left in the tile through a process called ionization. That energy is converted to, on average, 10 photons through an additional process called scintillation. Scintillation is the process by which a flash of light is produced in certain materials when they absorb ionizing radiation. For comparison, a 60 watt lightbulb emits ∼2x1020 photons per second. Those photons then travel along wavelength shifting fibers to that tile's PMT, where the photons are converted into an electronic signal. This entire process occurs in under 100 microseconds. Crucially, ionization is proportional to the square of the charge of the particle passing through the ACD. Since gamma rays have no charge while cosmic rays have a charge corresponding to their element, gamma rays will leave no energy in the ACD while cosmic rays will. We therefore use the ACD to distinguish between gamma rays and cosmic rays. The ACD detects 99.97% of cosmic rays that pass through it. A large fraction of these cosmic rays are removed before downloading the data from Fermi. Observed cosmic ray abdunces. The majority of cosmic rays are hydrogen (protons) and helium. 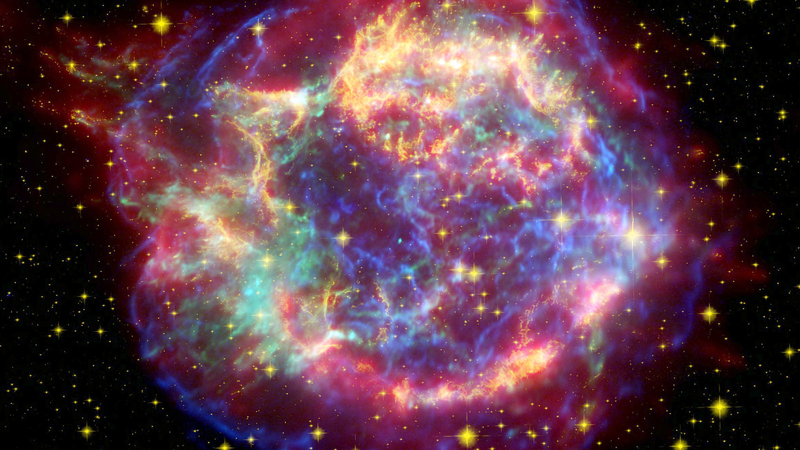 The remaining elements make up only about 1% of the cosmic rays observed. While gamma rays are the focus of most Fermi science, cosmic ray studies with Fermi-LAT data have also produced interesting results. One such study is to measure the abundance of different cosmic ray species. Since ionization is proportional to the square of the cosmic ray's charge, we can use the ACD's measured signal to determine the charge of the cosmic ray. Near 90% of cosmic rays are hydrogen (protons), 8% are helium, 1% are electrons, and the remaining 1% are all other elements. Cosmic-ray abundances are crucial in understanding of cosmic-ray origins and propagation through our Galaxy. This technique is common in other cosmic-ray experiments, for example: ISS-CREAM, ACE-CRIS, SuperTiger, and AMS-02.